I thought it was dead but 151 Front/7 Station Street, the weird cantilevered 36 storey creature, is alive and well. Spoke to the planner and the final report will be out in January. Section 37 worked out etc.. I'm assuming they have an eye on an anchor tenant since they've been working at this for more than a year. Any bets on whether or not it moves to u/c...? Fair amount of effort so far. BTW, even though RoCP3 (aka 444 Yonge) has been beaten to death by staff and (of course) appealed to OMB, the grapevine suggests they'll come back with another revision to the city before even a pre-hearing at OMB (given no site plan exists yet). No doubt another example of ask for 75 and get 66 (there are many Toronto storeys, and this is one of them. Storeys, get it?). A Superior report though rushed a bit. Wow. What are we to make the zig-zaggy lines on the elevation? Are those compression artifacts or design features? Zig zags are real... you could lose your knighthood for that question. Thanks for the info - 151/7 certainly took awhile to move through the pipeline. If memory serves, it came to the city before the BA proposal, even. I realized 151 Front Street/20 York was not on the 400 foot list, thus I updated it. But now I can't recall what the 18 York proposal was. UrbanDatabase doesn't have it listed under that name, but Emporis has an entry for it. Gb: i was suprised too. Canuck: 18 York is just damn confusing. I was wondering about this project... one I would really like to see move forward. Isn't much of the space in the building already accounted for? Data centre or something? 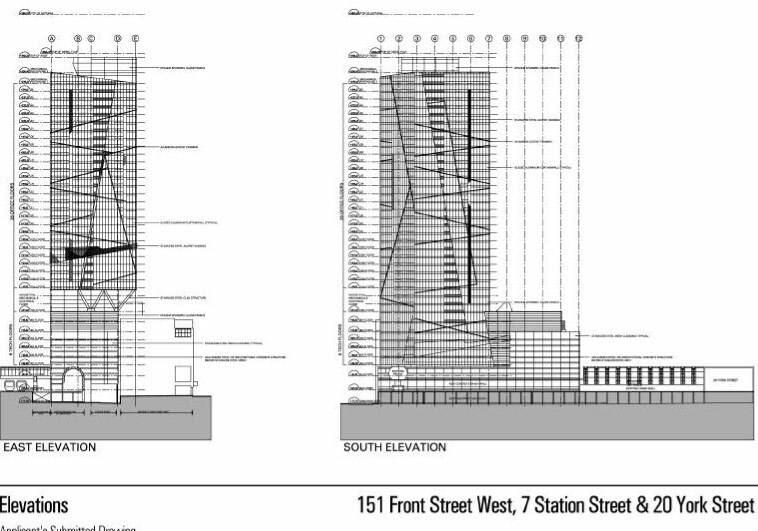 Canuck: don't know if you have this but the proposed height is 167.42 metres above Front Street West (north side)... it will certainly look quite tall from Lower Simcoe Street (south elevation). reconstruction, the SkyWalk and all existing walkway connections and exits will be replaced. and canopies over the Front Street West and Simcoe Street sidewalks) will not be redeveloped. mechanical rooms. The total gross floor area of the new centre will be 7,943 square metres. parking structure, the new technology centre and the office tower. It's great to see some more office space being proposed. Hard to tell what it will look like from a simple line drawing, but at 550 feet the height is respectable. I used to work for a company housed there. It's a remarkable facility. Wasn't the now almost demolished Molson building further east on Front going to be converted into a telecom carrier hotel? Ok I'm taking 18 York off the list. There's practically no info on it, and no talk of it in ages. So, the final report on this project was to have been finished in January. Was it? It would be great to hear that a 4th office tower could be moving ahead in the core!